The machine looks impressive - pulleys, weights, discs, ropes - designed to move together harmoniously and silently. I took hold of the reins and tossed my arms and body in waves of movements, seated but moved like a dancer and stretched like an athlete. That was my first experience using a Gyrotonic exercise machine. 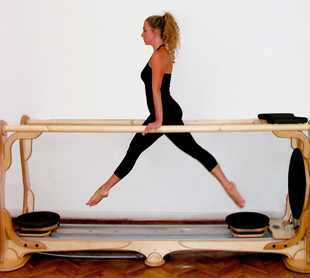 Gyrotonics is a system of exercise that blends movements from yoga, dance, gymnastics, swimming and tai chi. These exercises are synchronized with corresponding breathing patterns, thus enhancing aerobic and cardiovascular stimulation, and promoting neuro-muscular rejuvenation. 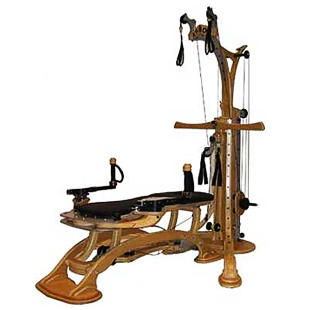 It employs the use of the Gyrotonic Expansion System (GXS), a specially-designed wooden machine with rotational discs and weighted pulleys that allow the user to stretch and strengthen the muscles through flowing circular movements. 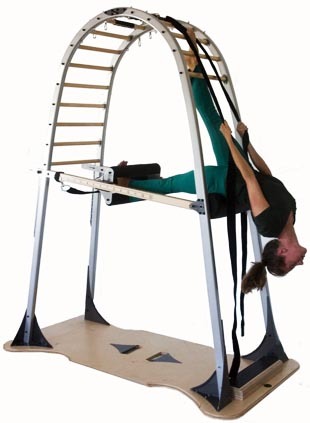 Gyrotonic is three-dimensional in its range of movements, and this is unique to this form of exercise. The system comprising the Pulley Tower, the Archway, the Leg Extension Unit and the Jump Stretching Board help users to achieve these movement patterns and motions comfortably. It is fully adjustable and can meet the needs of people with varying body shapes and levels of strengths. Invented by Juliu Horvath, a Hungarian, born in Romania who became a dancer from the age of 19. He moved to the United States and after some years, made it as a principal dancer with the Houston Ballet, but an injury ended his dancing career and he turned to yoga instead. After many years of intense study and self-exploration, he discovered the inner workings of the body and developed a system that he called "Yoga for Dancers", which is a deeper and more advanced level that is now called Gyrokinesis. Juliu wanted to create a machine that could help dancers to improve their movements and he put his creative energy to developed the GXS, a system that could benefit people of all ages and types of build, a machine that helps the user gain strength, flexibility and coordination. The benefits of the GXS are so extensive and profound that it is now a must-have item in rehabilitation centres, dance studios, sports training and fitness centres all over the world. Although gyrotonics may have originated as a way of helping dancers, but its teachers consider it to be beneficial for just about anyone, including those suffering from arthritis. The gentleness of Gyrotonics makes it particularly beneficial for those who are recovering from injuries or major surgeries. Gyrotonics even works on fingers and wrists – some experts believe it can even prevent carpal tunnel syndrome. Gyrotonics is a hit among golfers and tennis players as it loosens up the pelvis and improves rotation in the body. image . www.gyrotonic.com . image . www.metamorfosistudio.it .
. 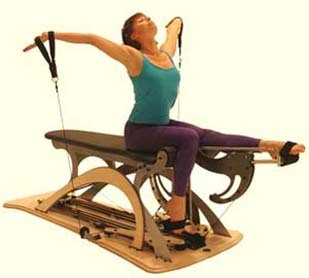 Improves posture - as your supportive core muscles get strengthened and stretched they naturally bring about a more upright and elegant posture.
. No stress on joints - suitable for people suffering from joint pain because of the unique way the pulleys are secured on the machines that allows movement without impact.
. Leads to better coordination - the major muscle groups work together as well as interdependently and over time, that leads to increased coordination.
. Lifts spirits - users report increased energy and raised spirits probably from the circular, spiral motions and the specific breathing patterns, which help relax tight muscles and stiff joints.
. Gives full spinal mobility - the Gyrotonic movements free the spine to move in all directions, hence improving back suppleness. The Gyrotonic machine is not your everyday exercise equipment that you can haul back to your living room if you do get hooked and want your own GXS. Firstly, it is big, real big. Secondly, you may have to fork out at least £2,500. It is a solitary form of exercise that requires commitment and discipline, it may be hard to keep at it unless you hire a trainer. On the other hand, Gyrokinesis can be conducted in a group, like Pilates and Yoga, and without the need of equipment.